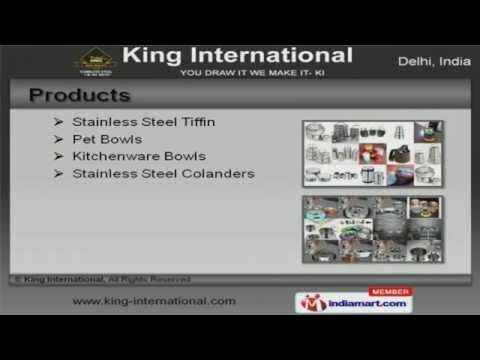 Welcome to King International, Manufacturer and Exporter of Stainless Steel Utensils. The company was established in the year 2009. We are a Member of Engineering Export Promotion Council of India and we serve to UK, US and other countries. Rama Krishna Electronics and LTS International are some of our esteemed clients and we are backed by cost effective prices and Experienced R and D department. We offer a vast range of Kitchenware Bowls, Stainless Steel Tiffin and Colanders. Stainless Steel Tableware, Dust Bins and Steel Spice Boxes offered by us are appreciated amongst our clients for superior quality. Our Stainless Steel Glass, Bread Baskets and Stock Pots are well known for their durability. Stainless Steel Dinner Sets, Hard Anodized Products and Stainless Steel Cutlery are available with us at cost effective prices. We also provide Corporate Gifts, Kitchen Tools and Accessories that are a class apart. Along with that we offer Bar-ware Accessories, Mess Tray for Hotels and Copper Dinner Sets that are cost effective.